Background Advanced prehospital interventions for severe brain injury remains controversial. No previous randomised trial has been conducted to evaluate additional physician intervention compared with paramedic only care. Methods Participants in this prospective, randomised controlled trial were adult patients with blunt trauma with either a scene GCS score <9 (original definition), or GCS<13 and an Abbreviated Injury Scale score for the head region ≥3 (modified definition). Patients were randomised to either standard ground paramedic treatment or standard treatment plus a physician arriving by helicopter. Patients were evaluated by 30-day mortality and 6-month Glasgow Outcome Scale (GOS) scores. Due to high non-compliance rates, both intention-to-treat and as-treated analyses were preplanned. Results 375 patients met the original definition, of which 197 was allocated to physician care. Differences in the 6-month GOS scores were not significant on intention-to-treat analysis (OR 1.11, 95% CI 0.74 to 1.66, p=0.62) nor was the 30-day mortality (OR 0.91, 95% CI 0.60 to 1.38, p=0.66). As-treated analysis showed a 16% reduction in 30-day mortality in those receiving additional physician care; 60/195 (29%) versus 81/180 (45%), p<0.01, Number needed to treat =6. 338 patients met the modified definition, of which 182 were allocated to physician care. The 6-month GOS scores were not significantly different on intention-to-treat analysis (OR 1.14, 95% CI 0.73 to 1.75, p=0.56) nor was the 30-day mortality (OR 1.05, 95% CI 0.66 to 1.66, p=0.84). As-treated analyses were also not significantly different. Conclusions This trial suggests a potential mortality reduction in patients with blunt trauma with GCS<9 receiving additional physician care (original definition only). Confirmatory studies which also address non-compliance issues are needed. The role of physicians in prehospital trauma care is controversial. Patients with head injury are probably the group most likely to benefit from the advanced interventions provided by physicians. This is the first randomised controlled trial to address this issue. The study suggests that there may be benefit for patients with blunt trauma with a GCS<9. High non-compliance rates means that further studies are required in systems where the non-compliance issues can be addressed. Insults accompanying severe blunt traumatic brain injuries such as hypoxia, hypotension and hypercarbia are associated with poor outcomes. It has therefore been suggested that patients with traumatic brain injury are particularly likely to benefit from advanced prehospital interventions that may treat or prevent these insults.1 Approaches to providing such interventions have varied across jurisdictions with physicians, or paramedics and nurses with advanced training used as prehospital care providers. However, there have been no randomised trials evaluating effectiveness of an advanced intervention prehospital treatment policy. This clinical trial aimed to determine whether the intervention of a physician led prehospital medical team resulted in better functional outcomes than a standard care regimen of care delivered by paramedics alone for severe blunt traumatic brain injury. We designed a randomised controlled, parallel group trial, conducted in the greater Sydney area of New South Wales, Australia, to evaluate the impact of prehospital physician intervention in the setting of severe head injury.2 A member of the physician response team monitored the New South Wales Ambulance computerised dispatch system via a web link to identify appropriate cases. Appropriate cases were blunt trauma in adults (>15 years) who were reported to be unconscious, having an altered level of consciousness, or a high-energy mechanism such as fall of more than 5 m or a pedestrian struck by a truck. Incidents with five or more casualties were excluded, as special arrangements applied in these situations. Identified cases were randomised to either standard ground paramedic treatment or standard treatment plus a physician arriving by helicopter. The original severe-head-injury subgroup was defined as patients with a GCS<9 at their first assessment by the treating prehospital team. 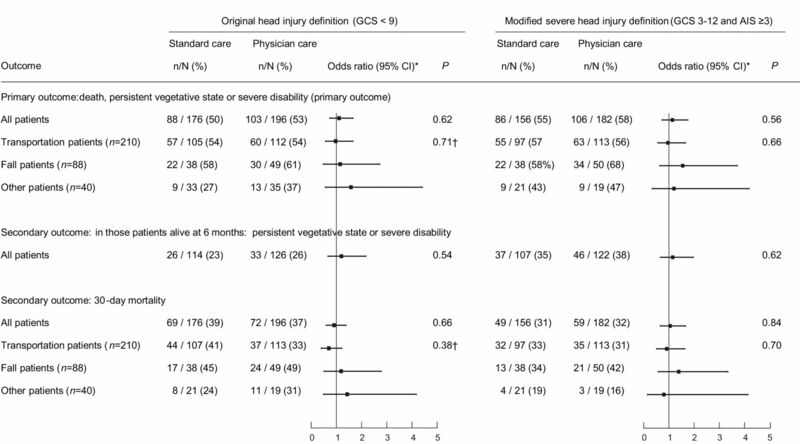 The study protocol was modified after the first interim analysis (140 patients enrolled meeting the original criteria), as some patients who met the criteria for the original severe-head-injury subgroup did not have severe head injuries, and many patients with an initial score of 9–12 had anatomically severe injury but would have been excluded from the primary analysis.2 The outcomes of patients identified by both original (GCS<9, ‘original’) and modified (GCS 3–12 and Abbreviated Injury Scale score ≥3, ‘modified’) definitions are reported. The criteria for randomising cases remained unchanged. Randomisation method was by computer-generated permuted blocks of 10, stratified by mechanism of injury (fall, transportation or other) and provided centrally by an automated telephone system from the National Health and Medical Research Council Clinical Trials Centre in Sydney. Masking at the time of intervention was not possible due to the nature of the interventions being studied. The outcome assessor who evaluated patients at follow-up 6 months post injury was blinded to treatment group and had no other role in the conduct of the trial. All patients received a ground paramedic response (standard care). If the patient was allocated to physician care, the physician team was dispatched by helicopter in addition to the standard response. The intervention team consisted of physicians with specialist certification in anaesthesia, emergency or intensive care medicine with more than 12 months of prehospital experience, plus a paramedic from the ambulance service. Treatment by the physician team followed protocols for standard trauma therapy as determined by the Royal Australasian College of Surgeons Early Management of Severe Trauma programme.3 If the physician team had not arrived when the road crew were ready to depart, patients were transported without waiting for the physician team, except in cases of high-grade airway obstruction. The road ambulance dispatch centre or officers on scene were able to request a physician team, regardless of treatment allocation, according to the system that existed before the trial began. Road paramedics could cancel the physician team if they believed that the patient did not require a higher level of intervention than that provided under Ambulance protocols. Standard care by paramedics only was according to written protocols of the New South Wales Ambulance including: cannulation and up to 1-litre intravenous crystalloid infusion; ventilation via supraglottic airways and bag-valve-mask ventilation; intubation without neuromuscular blockade; needle chest decompression; midazolam for seizures or sedation; analgesia with methoxyflurane and morphine and splinting and spinal immobilisation. Monitoring consisted of pulse oximetry, ECG and manual BPs. Interventions additional to standard care by the physician team included: anaesthesia with neuromuscular blockade and induction agents such as thiopentone or ketamine; surgical airways, needle cricothyroidotomy; tube or open thoracostomy; administration of 7.5% saline or 20% mannitol and administration of packed red blood cells. Intubated patients were ventilated with a portable volume cycled ventilator and monitored with waveform capnography and automated non-invasive BP measurement. All patients were transported to the nearest major (Level 1) trauma service hospital in accordance with the ambulance service transport protocols by the fastest available vehicle, given weather and traffic conditions. A helicopter was used for patient transport in the intervention arm only where there was a time advantage. After arrival in the trauma centre, the interventional component of the study concluded with subsequent management, according to the standard policies of the institution. Surviving, consenting patients who met the trial's follow-up criteria were interviewed by telephone 6 months after their injury. Criteria for interview were first GCS≤12; a fall in GCS to ≤12 before arrival in the emergency department unrelated to medication (including anaesthetics and sedatives) or an Abbreviated Injury Scale score ≥3 for the head region (2005 definitions). Outcome assessment interviews were conducted by a single research nurse, blinded to treatment allocation, or if an interview was not possible, outcome data was obtained from hospital medical records. Other patients not meeting these definitions for formal outcome assessment had their survival status at hospital discharge determined. The primary endpoint was the score on the Glasgow Outcome Scale (GOS),4 6 months after the injury, categorised as death, persistent vegetative state or severe disability versus moderate disability or good recovery. The GOS reflects disability, is the most widely used outcome measure for assessment after traumatic brain injury,5 allows different groups of patients to be compared simply6 and has been recommended as a measure of outcome for clinical trials.7 Secondary outcomes included duration of stay in hospital and the intensive care unit, 30-day mortality and rates of hypotension (defined as systolic BP<90 mm Hg) and hypoxia (defined as SpO2<92%) at first contact compared with hospital arrival. A sample size of 510 patients (255 per group) who met criteria for primary outcome analysis (GCS<9 on first contact) would provide 80% power to detect a relative increase of at least 23% in the categories, moderate disability/good recovery of the GOS score, assuming a 5% level of significance and a two-tailed comparison. This sample size was based on an ordinal scale,8 assuming a proportion of 52% in the death, persistent vegetative state or severe disability category (31%, 2% and 19%, respectively) and 30% and 18% in the moderate disability and good recovery categories, respectively. A 5% rate of non-compliance was assumed as this was the historical rate of physician intervention prior to commencement of the trial. Analysis was performed using SAS V.9.3. The effect of intervention within the mechanism of injury groups was the only planned subgroup analysis. The primary analysis was conducted according to the intention-to-treat principle. Supplementary analyses were prespecified to examine the sensitivity of the estimates for intervention, according to the protocol, and the actual intervention received. Comparisons for continuous variables used t-tests or Wilcoxon rank-sum tests as appropriate. Categorical data were analysed using a χ2 or the conditional binomial exact test,9 as appropriate. Logistic regression was used to compare binary outcomes, and intervention effects were summarised by ORs. Approval for the trial was granted by the Western Sydney Area Health Service Human Research Ethics Committee (approval number HS/TG HREC2002/12/4.25(1530)). Due to the nature of the intervention, patient consent could not be obtained prior to randomisation. The study, however, complied with the Australian National Health and Medical Research Council criteria for waiver of consent for highly dependent patients and the Human Research Ethics Committee approved the study on this basis. Retrospective consent was obtained from surviving patients for subsequent functional outcome assessment. Study safety was monitored by an independent data and safety monitoring committee, which maintained oversight of trial conduct, patient safety and the two planned interim analyses. Funding was provided by Insurance Australia Group, and the New South Wales Motor Accident Authority. CareFlight (NSW) assisted with provision of operational infrastructure. The trial is registered with Clinicaltrials.gov (NCT00112398). A total of 3124 incidents were randomised between May 2005 and March 2011, from which 3696 patients were identified. The last patient outcome assessment was performed in October 2011. As intervention allocation was required before the level of consciousness was confirmed, many subjects did not meet the criteria for severe head injury when subsequently assessed on the scene. This resulted in a much smaller group of patients with severe head injury than the number randomised. Three hundred and seventy-five patients met the original criteria (figure 1) and 338 patients met the modified criteria (figure 2). The Data and Safety Monitoring Committee met twice during this period to consider safety data and on both occasions deemed that there were no safety concerns. No adverse patient events due to enrolment in the trial were reported. Randomisation, enrolment and outcome data for the original criteria subgroup. Between 14 May 2005 and 14 March 2011, the study randomised 3124 incidents yielding 3696 identifiable patients. Of these, 375 patients met the original criteria for severe head injury. Randomisation, enrolment and outcome data for the modified criteria subgroup. Between 14 May 2005 and 14 March 2011, the study randomised 3124 incidents yielding 3696 identifiable patients. Of these, 338 patients met the modified criteria for severe head injury. The study was discontinued before the target 510 patients had been accrued due to poor recruitment and a greater non-compliance rate than had been planned for in the sample size calculation. The high non-compliance rate was driven by changes in local policy for the standard care group,2 and the study management committee considered it likely that policy changes by the New South Wales Ambulance would further increase this rate. The numbers of non-compliant patients in each arm by both the original and modified definitions are detailed in figures 1 and 2. In the standard care arm, New South Wales Ambulance physician teams were dispatched to incidents by either road or helicopter depending on proximity to their operations base. In the intervention arm, patients were not treated by physicians when either the road paramedics removed the patient from the scene before the physician team could arrive or they cancelled the physician team in cases where the patient would otherwise have qualified for inclusion. For both the modified and the original criteria, patients were similar with respect to baseline characteristics (table 1). Prehospital treatment and transport times, rates of physician-only intervention and correction rates of prehospital hypoxia and hypotension are presented in table 2. For both the modified and original criteria, the median time spent at scene was 6 min longer for patients who were allocated to physician intervention (p=0.02 and p<0.01, respectively), although the total prehospital time was significantly longer only in the original definition group. Rates of physician-only interventions were significantly higher in the group allocated to physician care, with occurrence of such interventions in the paramedic only allocation group reflecting the non-compliance rate. The numbers of patients in each subgroup that had their outcomes determined by record review as they were lost to follow-up2 are detailed in figures 1 and 2. In the intention-to-treat analyses of patients who met the modified criteria, there was no statistically significant difference in the primary endpoint of the GOS score at 6 months post injury (OR 1.14; 95% CI 0.73 to 1.75, p=0.56; figure 3). The results were similar when the analysis was restricted to patients alive at 6 months. There was also no difference in the 30-day mortality rate (OR 1.05, 95% CI 0.66 to 1.66, p=0.84). There was no difference between the groups in the total days in intensive care or hospital stay (table 3). Patients who met the original criteria showed similar results. When the effect of the intervention within injury mechanism subgroups was examined, there was no difference between the groups (figure 3). The tests of interaction were not significant. Main intention-to-treat results by treatment allocated and mechanisms subgroups. OR>1 indicates higher risk in the physician treated group. Separate analyses for those patients who received intervention, according to the protocol (ie, excluding those who did not receive the allocated intervention; ‘compliant group’); who received the intervention to which they were not allocated (‘non-compliant group’); and by intervention actually received regardless of allocation (‘as-treated group’) are presented in figure 4. In the original definition group, there were more deaths at 30 days in non-compliant (p=0.003) and as-treated patients (p=0.005) who received standard care. Those receiving additional physician care had a 16% decrease in mortality representing one fatality prevented for every six patients treated. There were also more patient deaths at 30 days in the modified definition non-compliant group receiving standard care where additional physician care was associated with a 7% mortality decrease needing 14 patients to be treated to prevent one fatality (p=0.04). Sensitivity analyses for the primary outcome and mortality. OR>1 indicates higher risk in the physician treated group. Three missing 6-month outcomes in the Original Head Injury Criteria group (one compliant patient and two non-compliant patients). We were unable to demonstrate a significant difference in the primary outcome measure between treatment groups in an intention-to-treat analysis in this study. Prespecified as-treated analyses indicated a potential mortality benefit in patients with GCS<9 receiving physician intervention with the number needed to treat to prevent one fatality being six in this group. Mortality analysis of non-compliant patients in the modified definition group also just reached statistical significance, although this group is the most likely to be biased by selection. The intention-to-treat analysis result could have been due to the high non-compliance rates combined with a smaller than planned sample size. Increasing emphasis by the Ambulance Service on dispatch of physician teams to patients who were considered likely to have severe injuries resulted in non-compliance rates that were much higher than planned and contributed to early termination of recruitment. Previous cohort studies examining the effectiveness of prehospital physician care compared with paramedic only care for severe head injury patients demonstrated an improvement in outcome associated with physician care.1 ,11–14 This is the first randomised trial designed to confirm these findings but faced numerous challenges in both conduct and logistical implementation. Although unable to confirm the results of previous studies, the trial was successful in achieving funding to study this high-cost intervention which is of considerable clinical and public health interest. However, Ambulance Service policy changes in introduction of a new proactive tasking system to identify patients for physician team response during trial recruitment resulted in higher than historical rates of dispatch of physicians to patients allocated to paramedic only care. Recruitment was also slower than planned. Attempts were made to increase the rate by adopting Night Vision Goggle technology 3 years into the trial enabling 12 h of availability to recruit per day in both summer and winter. Extending to more than 12 h per day was not possible due to pilot duty time and funding limitations. Extension of the recruitment area into an adjacent regional area was also explored but excluded due to New South Wales Ambulance tasking policies which would have resulted in dispatch of physician teams to all patients randomised to paramedic only care in this area. The primary analysis subgroup was modified after the first interim analysis, as some patients who met the original definition were found to not have significant traumatic brain injury. The modified definition including the Abbreviated Injury Scale score was used to retrospectively classify patients into the severe head injury group. The original definition of severe injury which is based only on the GCS is measurable at the incident scene and can be used to allocate patients to treatment groups regimens at the time of prehospital assessment. There was a 16% reduction in mortality in this group on as-treated analysis. Low GCSs can be secondary to factors such as hypotension or hypoxia and brain injury. It is possible that physiological derangement defines the group of patients who are most likely to benefit from advanced prehospital interventions rather than brain injury itself.15 Additionally, the Abbreviated Injury Scale is determined after treatments that may modify the score, so it may not be surprising that patients retrospectively selected from a larger data set on the basis of similar Abbreviated Injury Scale scores were also similar on other post-treatment measures such as the GOS scores. This study specifically addressed the issue of advanced prehospital interventions provided by physician teams. In other jurisdictions, advanced interventions may be provided by non-physician teams such as paramedics and nurses with advanced skill sets. The present study was not designed to compare these treatment models. 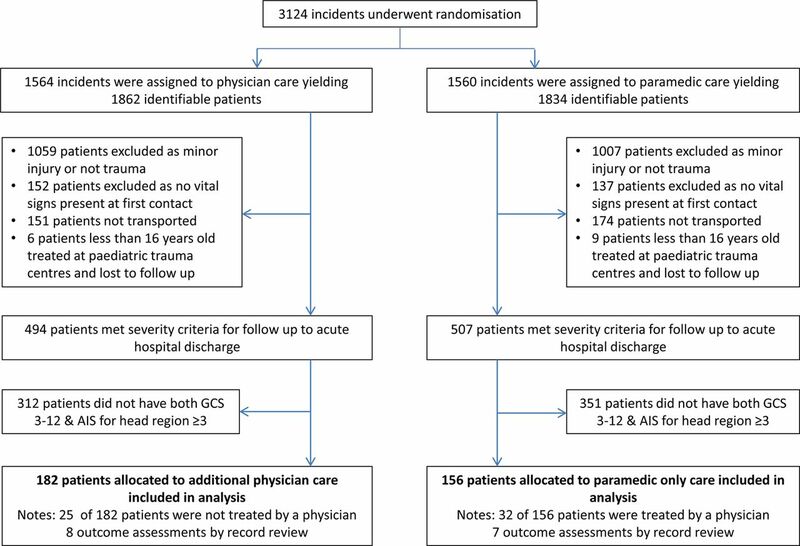 The results of this trial, however, combined with the previous cohort studies on this subject, indicate that a trial examining the benefit of physician prehospital intervention on mortality in unconscious patients (GCS<9) at the accident scene is now needed. This randomised study of adult blunt injury suggests a reduction in 30-day mortality in patients with blunt trauma with GCS<9 receiving physician prehospital care. Changes in ambulance service policies resulted in high non-compliance rates and difficulty continuing recruitment to the planned sample size in this study making interpretation of the intention-to-treat analyses problematic. Nevertheless, the sensitivity analyses suggest a clinically significant mortality reduction in patients with GCS<9, a finding which should be confirmed by further studies that address non-compliance issues. The investigators thank NSW Ambulance for access to the computerised dispatch system, and Concord, Liverpool, Nepean, Prince of Wales, Royal North Shore, Royal Prince Alfred, St George, St Vincents and Westmead Hospital trauma services who assisted with access to patient data. Early Management of Severe Trauma course content. Royal Australasian College of Surgeons. 2013. http://www.surgeons.org/for-health-professionals/register-courses-events/skills-training-courses/emst/emst-overview/ (accessed 30 Dec 2013).
. Neurobehavioral outcome: the neurosurgeon's perspective. In: Levin HS, Grafman J, Eisenberg HM, eds. Neurobehavioral recovery from head injury. Oxford: Oxford University Press, 1987:206–12.
. The diagnosis of head injury requires a classification based on computed axial tomography. J Neurotrauma 1992;9:S287–292. Contributors AAG: Study guarantor, literature search, study design, data interpretation, and writing of the manuscript. KPM: data analysis, revision of the manuscript. MF: study design, data collection, and revision of the manuscript. EP: data collection, revision of the manuscript. VG: study design, data analysis and interpretation, writing of the manuscript. Funding Insurance Australia Group, NSW Motor Accident Authority. Competing interests All authors have completed the Unified Competing Interests form at http://www.icmje.org/coi_disclosure.pdf (available on request from the corresponding author) and declare that (1) AG has support from CareFlight for the submitted work; (2) AG, KM, MF, EP and VG have no relationships with companies that might have an interest in the submitted work in the previous 3 years; (3) their spouses, partners or children have no financial relationships that may be relevant to the submitted work and (4) AG, KM, MF, EP and VG have no non-financial interests that may be relevant to the submitted work. AG affirms that the manuscript is an honest, accurate and transparent account of the study being reported; that no important aspects of the study have been omitted and that any discrepancies from the study as planned and registered have been explained. All authors, external and internal, had full access to all of the data (including statistical reports and tables) in the study and can take responsibility for the integrity of the data and the accuracy of the data analysis. All researchers are independent of the funding agencies (Insurance Australia Group and the NSW Motor Accidents Authority). AG and EP are employed by CareFlight, a not-for-profit aeromedical service provider who contributed operational infrastructure for the trial. The study funders had no role in study design; in the collection, analysis and interpretation of data; in the writing of the report and in the decision to submit the article for publication. AAG reports grants from Insurance Australia Group, grants from NSW Motor Accident Authority, during the conduct of the study and Medical director of CareFlight, a not-for-profit company that provides aeromedical services. Ethics approval Western Sydney Area Health Service Human Research Ethics Committee, approval number HS/TG HREC2002/12/4.25(1530).